The Philadelphia Inquirer is a morning daily newspaper that serves the Philadelphia, metropolitan area of the United States. 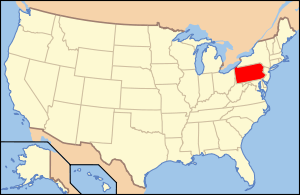 The newspaper was founded by John R. Walker and John Norvell in June 1829 as The Pennsylvania Inquirer and is the third-oldest surviving daily newspaper in the United States. Owned by Philadelphia Media Network, The Inquirer has the eighteenth largest average weekday U.S. newspaper circulation and has won nineteen Pulitzer Prizes. It is the newspaper of record of the Delaware Valley. The editor is Bill Marimow. Stan Wischnowski is Vice President of News Operations. In 1969, Annenberg was offered US$55 million for The Inquirer by Samuel Newhouse, but having earlier promised John S. Knight the right of first refusal of any sale offer, Annenberg sold it to Knight instead. The Inquirer, along with the Philadelphia Daily News, became part of Knight Newspapers and its new subsidiary, Philadelphia Newspapers Inc. Five years later, Knight Newspapers merged with Ridder Publications to form Knight Ridder. When The Inquirer was bought, it was understaffed, its equipment was outdated, many of its employees were underskilled and the paper trailed its chief competitor, the Evening Bulletin, in weekday circulation. However, Eugene L. Roberts Jr., who became The Inquirer's executive editor in 1972, turned the newspaper around. Between 1975 and 1990 The Inquirer won seventeen Pulitzers, six consecutively between 1975 and 1980, and more journalism awards than any other newspaper in the United States. Time magazine chose The Inquirer as one of the ten best daily newspapers in the United States, calling Roberts' changes to the paper, "one of the most remarkable turnarounds, in quality and profitability, in the history of American journalism." By July 1980 The Inquirer had become the most circulated paper in Philadelphia, forcing the Evening Bulletin to shut down two years later. The Inquirer's success was not without hardships. Between 1970 and 1985 the newspaper experienced eleven strikes, the longest lasting forty-six days in 1985. The Inquirer was also criticized for covering "Karachi better than Kensington". This did not stop the paper's growth during the 1980s, and when the Evening Bulletin shut down, The Inquirer hired seventeen Bulletin reporters and doubled its bureaus to attract former Bulletin readers. By 1989 Philadelphia Newspapers Inc.'s editorial staff reached a peak of 721 employees. The 1990s saw gradually dropping circulation and advertisement revenue for The Inquirer. The decline was part of a nationwide trend, but the effects were exacerbated by, according to dissatisfied Inquirer employees, the paper's resisting changes that many other daily newspapers implemented to keep readers and pressure from Knight Ridder to cut costs. During most of Roberts's time as editor, Knight Ridder allowed him a great deal of freedom in running the newspaper. However, in the late 1980s, Knight Ridder had become concerned about The Inquirer's profitability and took a more active role in its operations. Knight Ridder pressured The Inquirer to expand into the more profitable suburbs, while at the same time cutting staff and coverage of national and international stories. Staff cuts continued until Knight Ridder was bought in 2006, with some of The Inquirer's best reporters accepting buyouts and leaving for other newspapers such as The New York Times and The Washington Post. By the late 1990s, all of the high level editors who had worked with Eugene Roberts in the 1970s and 1980s had left, none at normal retirement age. Since the 1980s, the paper has won just one Pulitzer, a 1997 award for "Explanatory Journalism." In 1998 Inquirer reporter Ralph Cipriano filed a libel suit against Knight Ridder, The Philadelphia Inquirer, and Inquirer editor Robert Rosenthal over comments Rosenthal made about Cipriano to The Washington Post. Cipriano had claimed that it was difficult reporting negative stories in The Inquirer about the Roman Catholic Archdiocese of Philadelphia and Rosenthal later claimed that Cipriano had "a very strong personal point of view and an agenda...He could never prove [his stories]." The suit was later settled out of court in 2001. The paper launched an online news desk in the early 2000s in order to compete with local radio stations for breaking news. :48–49 Knight Ridder was bought by rival The McClatchy Company in June 2006. The Inquirer and the Philadelphia Daily News were among the twelve less-profitable Knight Ridder newspapers that McClatchy put up for sale when the deal was announced in March. 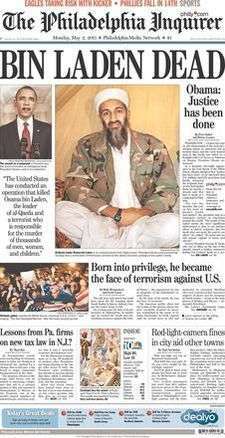 On June 29, 2006, The Inquirer and Daily News were sold to Philadelphia Media Holdings LLC, a group of Philadelphian area business people, including Brian P. Tierney, Philadelphia Media's chief executive. The new owners planned to spend US$5 million on advertisements and promotions to increase The Inquirer's profile and readership. In the years following Philadelphia Media Holding's acquisition, The Inquirer has seen larger than expected revenue losses, mostly from national advertising, and continued loss of circulation. The revenue losses have caused management to cut four hundred jobs at The Inquirer and Daily News in the three years since the papers were bought. Despite efforts to cut costs, Philadelphia Newspapers LLC, filed for Chapter 11 bankruptcy protection on February 21, 2009. Philadelphia Media Holdings was about US$390 million in debt due to money borrowed to buy The Inquirer and Daily News. The bankruptcy was the beginning of a year long dispute between Philadelphia Media Holdings and creditors. The group of creditors, which include banks and hedge funds, wanted to take control of Philadelphia Newspapers LLC themselves and oppose efforts by Philadelphia Media Holdings to keep control. Philadelphia Media Holdings received support form most of the paper's unions and launched a public relations campaign to promote local ownership. A bankruptcy auction was held on April 28, 2010. The group of lending creditors and a group of local investors allied with Brian Tierney both bid for Philadelphia Newspapers, but the lenders had the winning bid. The deal fell through after the group of lenders, under the name of Philadelphia Media Network, was unable to reach a contract agreement with the union representing the company's drivers. Philadelphia Newspapers, represented by Lawrence G. McMichael of Dilworth Paxson LLP, challenged the right of creditors to credit bid at a bankruptcy auction. The U.S. Court of Appeals for the Third Circuit held that credit bidding was not permitted. The papers went up for auction again in September and again Philadelphia Media Network won the bid. After successfully negotiating a contract with all of the paper's fourteen unions, the US$139 million deal became official on October 8. The Philadelphia Inquirer continued to struggle to make a profit due to competition from digital media sources. By May 2012 the combined journalist staff at all of Philadelphia Media Network was about 320 and some of the same stories and photographs appear both in The Inquirer and Daily News. On April 2, 2012, a group of local business leaders under the name of Interstate General Media LLC. The buyers paid $55 million for the paper, which is less than 15 percent of the $515 million spent to buy the papers in 2006. The Inquirer is now part of Philadelphia Media Network, LLC. PMN's owner is H.F. "Gerry" Lenfest, who appointed C.Z. "Terry" Egger as Publisher and CEO in October 2015. 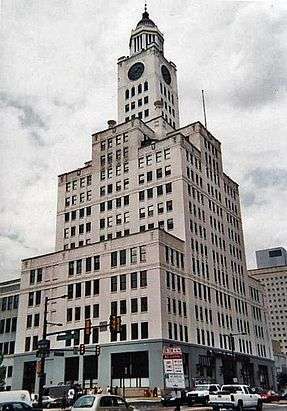 In October 2011, Philadelphia Media Network sold the Inquirer Building to developer Bart Blatstein of Tower Investments Inc. who intends to turn the complex into a mixed use complex of offices retail and apartments. 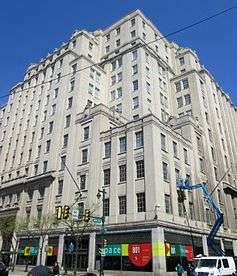 The next month publisher and CEO Gregory J. Osberg announced that 600 of the 740 Philadelphia Media Network employees of The Inquirer, Daily News and Philly.com would move to office space in the former Strawbridge & Clothier department store on east Market Street. The remaining employees would move to offices in the suburbs. The Philadelphia Media Network moved to the new location in July 2012, consolidating the offices entirely on the third floor. Cutbacks had left much of the 525,000 square feet (49,000 m2) within the Inquirer Building empty but the 125,000-square-foot (12,000 m2) east Market Street location will consolidate Philadelphia Media's departments including the Daily News' newsroom with The Inquirer's. The new location will include a street level lobby and event room. Plans for the building also include electronic signage such as a news ticker on the corner of the high-rise. ↑ "Inky Print Circulation Continues to Decline". Philadelphia Magazine. May 1, 2014. Retrieved July 22, 2015. 1 2 3 4 5 6 Wilkinson, Gerry. "The History of the Philadelphia Inquirer". Philadelphia Press Association. Retrieved May 27, 2006. ↑ "Inquirer's New Headquarters Won't Have 'Daily News' on the Marquee." (Archive). CBS Philadelphia. April 13, 2012. "In an interview with KYW Newsradio after the vote, the papers' attorney, Michael Sklaroff, described the awning: 'It's the Philadelphia Inquirer. It's our newspaper of record. It's going to be beautiful.'" 1 2 3 4 5 6 7 8 9 10 11 12 13 14 15 Williams, Edgar (June 20, 2003). "A history of The Inquirer". The Philadelphia Inquirer. Archived from the original on February 19, 2007. Retrieved May 27, 2006. ↑ "Again, Curtis-Martin". Time. March 17, 1930. ↑ "Philadelphia Purchase". Time. August 10, 1936. 1 2 3 4 5 Ogden, Christopher (1999). Legacy: A Biography of Moses and Walter Annenberg. New York: Little, Brown and Company. ISBN 0-316-63379-8. 1 2 3 4 Henry III, William A. (April 30, 1984). "The Ten Best U.S. Dailies". Time: 61. 1 2 Shapiro, Michael (March–April 2006). "Looking for Light". Columbia Journalism Review. 1 2 Lewis, Frank (October 21–28, 1999). "Sinking Ship". Philadelphia City Paper. ↑ Merritt, Davis (2005). Knightfall: Knight Ridder and How the Erosion of Newspaper Journalism is Putting Democracy at Risk. New York: AMACOM. ISBN 0-8144-0854-0. ↑ Lewis, Frank (January 11–18, 2001). "So Sorry". Philadelphia City Paper. ↑ Lewis, Frank (June 18–25, 1998). "Bob and Weave". Philadelphia City Paper. 1 2 Anderson, C. W. (2013). Rebuilding the news metropolitan journalism in the digital age. Temple University Press. ISBN 9781439909355. ↑ "Knight Ridder bought for $4.5bn". BBC News. March 13, 2006. Retrieved May 28, 2006. ↑ DiStefano, Joseph N. (June 30, 2006). "Job 1 for new owners: Raise papers' profile". The Philadelphia Inquirer. ↑ Volk, Steve (February 2009). "1978 Called. It wants its Newspaper Back". Philadelphia Magazine. Retrieved February 1, 2009. ↑ Loviglio, Joann (January 3, 2007). "Philadelphia Inquirer lays off 71 people". BusinessWeek. ↑ Pérez-Peña, Richard (February 22, 2009). "Philadelphia Newspapers Seeking Bankruptcy". The New York Times. Retrieved February 24, 2009. ↑ Denvir, Daniel (September 3, 2009). "Local Flavor". Columbia Journalism Review. ↑ Hepp, Christopher K.; Harold Brubaker (April 28, 2010). "Phila. Newspapers sold to lenders". The Philadelphia Inquirer. ↑ Van Allen, Peter (September 15, 2010). "Sale of Inquirer, Daily News voided, new auction date set for Sept.". Philadelphia Business Journal. Retrieved May 11, 2011. ↑ Church, Steven (September 24, 2010). "Philadelphia Inquirer Lenders Best Perelman in Bankruptcy Court Auction". Bloomberg Businessweek. Retrieved July 19, 2012. ↑ "Meet the New Boss: Philly Newspapers Sale Finally Completed". Editor & Publisher. October 8, 2010. Retrieved May 11, 2011. 1 2 "Philadelphia Inquirer sold to political figures". Associated Press. April 2, 2012. Retrieved July 18, 2012. ↑ Gammage, Jeff (August 25, 2015). "'Terry' Egger named publisher of Philadelphia Media Network". The Inquirer. Retrieved October 24, 2015 – via Philly.com. ↑ Fernandez, Bob (November 14, 2011). "Inquirer, DN moving to 8th & Market". The Philadelphia Inquirer. 1 2 Saffron, Inga (July 14, 2012). "Will our move to Market Street move the street?". The Philadelphia Inquirer. ↑ Shapiro, Howie (May 23, 2006). "Asking 'Why?' since 1829". The Philadelphia Inquirer. 1 2 Weigley RF et al. (eds): (1982). Philadelphia: A 300-Year History. New York and London: W. W. Norton & Company. pp. 388, 404–405. ISBN 0-393-01610-2. ↑ DiStefano, Joseph N. (May 9, 2006). "Shrinking only on paper". The Philadelphia Inquirer. ↑ Panaritis, Maria (March 1, 2008). "Audit reduces Inquirer Sunday circulation". The Philadelphia Inquirer: D01. ↑ The Radio Factor with Bill O'Reilly, February 13, 2006. ↑ Smerconish, Michael (July 13, 2006). "Meet the New Boss, Same as the Old Boss?". Philadelphia Daily News. ↑ Graham, Troy (May 9, 2006). "Inquirer's pick comes with a dissent". The Philadelphia Inquirer. ↑ "Who's for Whom". Time. November 8, 1976. ↑ Interviewed by David Barsamian (July 14, 1993). "Edward Herman Beyond Hypocrisy: Decoding the News". Archived from the original on May 5, 2006. Retrieved July 9, 2006. ↑ Herman, Edward. "The Philadelphia Inquirer's New "Right Stuff" Program". Retrieved July 9, 2006. ↑ "Muslims Protest Philadelphia Newspaper's Publishing of Cartoon". Associated Press. February 13, 2006. ↑ Dilanian, Ken (May 24, 2006). "Frequent critic of media takes newspapers' helm". The Philadelphia Inquirer. ↑ Van Allen, Peter (April 3, 2012). "Reaction to the latest sale of daily newspapers". Philadelphia Business Journal. Retrieved July 18, 2012. ↑ Carr, David; Amy Chozick (April 4, 2012). "Marimow to Return as Editor of Philadelphia Inquirer". The New York Times. Retrieved July 19, 2012. ↑ "Philadelphia Inquirer". Philadelphia Media Holdings. Archived from the original on November 18, 2007. Retrieved July 19, 2012. ↑ "Phl17 Station History". PHL17. Retrieved July 18, 2012. ↑ Blackwell, Eva (August 1, 2005). "NBC 10 And Inquirer Announce News Partnership". NBC10.com. ↑ Albiniak, Paige (November 19, 2006). "WCAU Remakes Evening News". Broadcasting & Cable. Retrieved July 18, 2012. ↑ "Search: Inquirer, Philadelphia, Winner". The Pulitzer Prizes: Columbia University. Retrieved July 19, 2012. Wikimedia Commons has media related to Philadelphia Inquirer.